For some time now I’ve wanted to rework some standard monsters into more ‘Teratic form’. I need a break from the Echelon Reference Series, if only for a few days, so I thought I’d take a run at some. There are four primary points to remember in these adaptations. They are inhuman. It is not enough to make them look different, there must be something other about them. This otherness does not need to be horrifying, but it has to stand out as not human. Grounded in the setting. The monsters in the core rules (any core rules, really) tend to be written to be somewhat generic, so they can be readily applied in many campaigns and settings. Teratic monsters have at least an implied setting — I may not know where the Forest of Kirela is, but I know you can find hilljacks there… unless they find you first. There is nothing quite like them. Each monster (or group of like monsters may share some characteristics with others, but there is something that makes them stand apart from even the others they are similar to. Identifiable even when not present. Whether it’s the spoor they leave behind, the nature of the wounds they leave on their victims, or the omens of their coming, there are signs that they have been or will be present. I had originally planned to focus on one creature type at a time, but I think instead I will pick a theme and build around that, probably using multiple monster types. This gives me a little more freedom to pick while I’m getting a feel for the process, then I may decide to narrow my focus. So, since my imagination needs help, I have some random ideas to get me started. I’ll have to think about these and what they might mean, since the meanings do not have to be obvious. I should also generate some other elements (locations, customs, beliefs) but unfortunately my portable library drive is broken and my books are at home. I’ll have to come back to that. How far should point 1 go? (I’m assuming “not human” in the sense of “not a person”, since some PCs are e.g. elves.) Once you have a race with a language and tool use it’s tricky to make them not recognisable as some sort of person. Would you be satisfied with something that has those things but some other monstrous attributes to counteract? And of course the classic “orc babies” are a complete deal-breaker as far as all that goes. I don’t know how to pull off a monstrous humanoid race with language, tool use, and a nursery. Not without straying into parodies of real-world nationalism/racism/etc anyway. It occurred to me that I subconsciously avoided the “orc babies” problem with the Red Horror kobolds: they reproduce via other means. Another thing to think about (considering that these monsters will appear in an RPG context) is a motivation for gold/treasure-hoarding behaviour. Use of currency is a “people” mannerism too. Regarding treasure, perhaps they don’t use conventional currency but some of the ichors and infusions they use are of great value. Of course the Red Horrors are a terrible danger and are to be destroyed whenever discovered… but the penultimate step in the evisceration that leads to a new Red Horror involves dousing the not-quite-dead victim with a fluid that will revivify his offal as it is extracted. This could be a precious, precious fluid (treat as a potion of breath of life or raise dead, perhaps). I’m thinking really that there should be something that is inhuman, alien. Even the near-human… elves are immortal, or near to it. What does that do to their minds? Do they become the wise ancients? Or lapse into dementia? Become crazed from the weight of ages, or immobilized by the accumulation of eons of experience? Perhaps they are more like the wolfriders of ElfQuest, who ‘live in the now’ — they have enough memory to function, but for almost all of them it is no longer than human memory and eventually what happened long ago is lost. This could lead to a constant loss and rebirth of innocence; even though the body survives for millennia the mind does not (which could be another reason we don’t have the “super high level elves” some people think should rule the world). There’s a productive little discussion about the difference between person-monsters and monster-monsters. They’re unusual. This is a variation on your #3. If a given type of monster is too common, it becomes too ordinary. Monstrous monsters should be unique or rare. They’re dangerous. Maybe not in terms of raw physical harm (although that’s certainly an option), but their interests are detrimental to those of humanity. This may be malicious or accidental, but the important point I am taking is that there can be no common ground; we can’t coexist safely with them. A junction of these two things which I spotted is the class of monsters that reproduce unusually. Werewolves and vampires are the classic examples: they reproduce by infecting humans. This both limits their number and puts them at odds with humanity. They’re uncontrollable. If the monster is animalistic, it can’t be tamed or harnessed. If it’s intelligent, it nevertheless can’t be bargained with. The latter needn’t necessarily be due to malice: perhaps it’s resolutely indifferent, or above our level, or regretful that it has higher concerns than our safety. But nothing we do can change its mind, so we must fight or flee. I don’t think my Red Horror kobolds achieved your #2 very well: I did give them a specific location, but it’s just an interchangeable label. I’ll add a fourth point of my own: monsters change rules. Either it follows a rule that nothing else does (e.g. can’t cross running water) or it breaks a rule everything else follows (e.g. “down” is always at right angles to the surface it is standing on). The scale of a monster’s rule-breaking shows how powerful the monster is. I think rule-breaking is generally more monstrous: rule-creating limits the monster. I think this is related to your #2. In order to change the rules of the world, the monster must first be inside it. Think about powergamer uber-characters: they operate within the rules of character creation, but bend and warp those rules to create something out of the ordinary. Your #4 is related to a horror tactic as well: the monster you imagine is scarier than the monster you see, so start building up the monster to your audience (the players) long before they actually meet it. “Interchangeable label” is adequate at this point, since the underlying setting is not present. “Breaking rules” is an interesting point. I’ll have to keep it in mind, even if I don’t make it part of my definition. I saw that post this morning, didn’t have time to really read it. I can agree that being dangerous in some manner, whether malicious or not, is a critical element of being a monster. Without that it might be a curiosity. However… bugger. ‘Teratic’ does, according to this dictionary definition, mean ‘monstrous’. 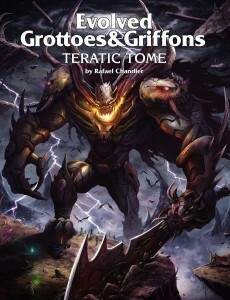 Still, my use of it in this thread is to do with monsters having a style similar to that of the Teratic Tome. Even the relatively benign creatures can exhibit traits you might find in the Teratic Tome but not be a deliberate threat. … I may have just talked my way around to your point, actually. ‘Deliberate threat’ is actually kind of weaselly. The teratic gnomes have need of plotdevicium that can be found in that cliff, and are quite prepared to simply collapse the cliff face to get at it. Sorry about your village, but our need is urgent. The teratic solar is implacable and regrets the loss of innocent life that will come of this battle, but the alternatives are worse. Not facing the Foe here will mean it has time to grow in power, spread its taint across the land, and bring the lash and fire upon many more. The solar must prepare for this conflict, it is up to you to save who you can. Yeah, I think you’re right. There probably will usually be some element of danger involved. It might not be malicious, but there probably will be circumstances under which blood will be spilled. Danger could also be psychological: living near a creature that causes madness in those who look at it would be dangerous even if it’s not actively malicious. Danger can be economic: in the real world we think of megacorps as “monstrous” when they crush small companies. I don’t quite know how to import this into a fantasy setting. Danger can be existential: refugees from a dying world have migrated to our plane and are spreading out. The physical laws they have brought with them are incompatible with life as we know it. When a murderer dies unpunished, a mandrake plant may spring up on his grave. The root grows fat on nourishment from the deceased’s body and swells into a humanoid form. After nine months, a humanoid being with the head of a hyena bursts from the soil with a terrifying shriek. This is the monster known to the villagers of Rillaham as a Screaming Fiend. The Screaming Fiend makes a nest in an obscure place, and prefers to sleep during the day. At night it goes out on the hunt. It exclusively eats meat, and prefers to eat from still-living creatures. A corpse which has been dead for more than a few hours is unappetizing to it. It is not especially stealthy, preferring to scare prey into ambushes or dead-ends using its ability to mimic a variety of horrifying screams. It likes to use its claws and fangs to tear ragged, painful wounds in order to inflict as much pain as possible. Its favourite prey are humans and other intelligent creatures. The Screaming Fiend can draw power from intelligent creatures who die screaming. The fiend consumes this sound and later uses it to evoke supernatural terror in other victims with a fearsome scream. The village of Rillaham lies on the road down from the Mountains of Aradan. Ore from the mountain settlements flows down via this route. The PCs may have been hired to protect traders travelling to/from the mountains. The village is adjacent to forests to the east and west, with the mountains surrounding the area on three sides, leaving the south open. The village site is near the junction of several streams coming off the mountains, where they become a small river leading south. The main trade route to the outside world goes down the east edge of the river. As the PCs approach the village, a dismembered body can be seen in the middle of the road; the limbs are missing and the rest is chewed. These are the remains of Flora Wertengale, mother of two, who went out to fetch water the previous night but didn’t return. The villagers have suffered several such attacks over the past few months, and livestock have also been savaged. At nights, especially on nights when an attack occurs, terrible screams can be heard echoing around the valley. Some families are considering packing up and moving elsewhere. Some villagers have seen suspicious humanoid shadows moving through the forests, but nobody has seen the perpetrators of the attacks. The first victim was a brawny young acolyte of the god of Justice, sent by his superiors to investigate a rumour. Thirty years ago, two brothers named Barrock and Attim Tarenna had fled the authorities in a nearby city while suspected of the murder of a young lady. Two men of similar description had settled in Rillaham a few weeks later, taking up jobs as a blacksmith and huntsman. This only came to light recently after a chance observation by clerks reviewing census records. The acolyte was disappointed to discover that the brothers, now old men, had but recently died of natural causes just under a year previously. That night, the first screams were heard, and the acolyte’s head and left leg were found the next morning. The brothers were quiet but accepted as members of the village, and after their deaths had been interred at the community graveyard to the northeast, in a meadow on the edge of the forest. Their decaying bodies still lie here, but the coffins are broken, and the ground above the graves has partially collapsed to fill a hole in the disturbed earth. Some dead mandrake leaves and bits of broken root can be found in the troubled ground. Smaller mandrake plants grow around the area. One of the Screaming Fiends has nested a little way into the northeastern forest, having burrowed under the roots of a fallen tree. A scattering of bones gives away the location if the PCs come near. It will be sleeping here during the day and will fight if disturbed. The fiend has a death-scream stored, but will only use it if things are looking dire. Treat the fiend as an 11hp gnoll with a one-shot cause fear spell, Con-based DC. The fiend uses claw/claw/bite in place of artificial weapons. The second is nesting much further northeast, near the opposite edge of the forest in a natural cavern on the bottom slopes of the mountains. The fiend usually sleeps near the entrance. It is colder up here and the fiend has built a small fire to warm itself (it doesn’t cook its food); a thin trail of smoke may be visible in the early mornings. This fiend also has a death-scream available; again, it will choose the moment to use it carefully. Use the same stats as before. A trail of bones and scraps leads deeper into the cavern: some of the bones look quite old. A faint flickering light can be seen once you move away from the entrance. The light comes from a candlelit cavern. Fresh human bones are nearby, with a larger heap of older refuse tucked in one corner. A much older and greyer Screaming Fiend is here, normally studying a scroll and book. The other fiend’s screaming in combat will not have disturbed him, but if the PCs made a lot of noise he may be lying in wait for them. This fiend will fight in two stages, each 10hp. In the first stage he will fight as the other fiends, but with two death-screams available for him to use. He will be much less sparing with them than the others were, using them as soon as he sees an opening. He can also use a vicious rake attack if he hits with both claws. When the fiend’s first stage reaches 0hp, as an immediate action he leaps up and gives out a powerful shriek, causing a partial cave-in. Everyone is knocked prone and takes 1d6 damage from falling rocks (Reflex negates damage, Con-based DC). Remove any ongoing conditions from the fiend and reset him to 10hp. In the second stage of this fight, he will concentrate on fighting defensively, either readying an actions to hit anyone who approaches or dashing away from potential engagements. He has a single death-scream remaining. He can also attack by knocking loose a stalactite with a shriek, knocking prone anyone underneath it (Reflex negates, Con-based DC). Assume that at the start of the battle there is one stalactite per 5ft square of the cavern: keep track of which ones have fallen, but let the PCs figure out how to keep track of it themselves. When the second stage reaches 0hp, the Screaming Fiend finally dies. The scroll and book he was inspecting belonged to the acolyte of the god of Justice; these and the rest of his possessions could be returned to the city temple. The scroll is a magical scroll of command, and it appears from some crudely-scribbled notes that the old fiend was attempting to learn the spell. The old fiend was born after the death of a respected elder of the village a long time ago, Shaneer Toneth. She became the head of the village when the previous headman (Bern Wertengale, grandfather of Flora) died after a protracted illness during which she cared for him. In actual fact she used poisonous berries in his food to hasten his demise. These events happened long ago, but her portrait still hangs in the village hall. Nobody suspects that Bern’s death was murder. Some of the older villagers may remember something about Shaneer’s grave being disturbed once. Apologies for the hurried writing, it could use some editing. The staged boss fight mechanic was borrowed from The Angry DM. Also, I just realised that cause fear only affects a single target… dammit. I was thinking the writing was a little rough. For spells, scare (sor/wiz 2, bard 2 in Pathfinder) affects one living creature per three levels, and fear (sor/wiz 4, bard 3 in Pathfinder) is a 30-foot cone-shaped burst (all targets in the area are panicked on a failed save and shaken for one round on a successful save). I’ve bookmarked the Angry DM post for later, I’ve got to get to work. Maybe just replace the whole thing: the scream is a sonic fear effect which causes creatures within 20ft to become frightened for 1 round (Will negates). I was considering the gnomes you mentioned, and I think I might be able to make that “economic danger” thing work… more to follow.